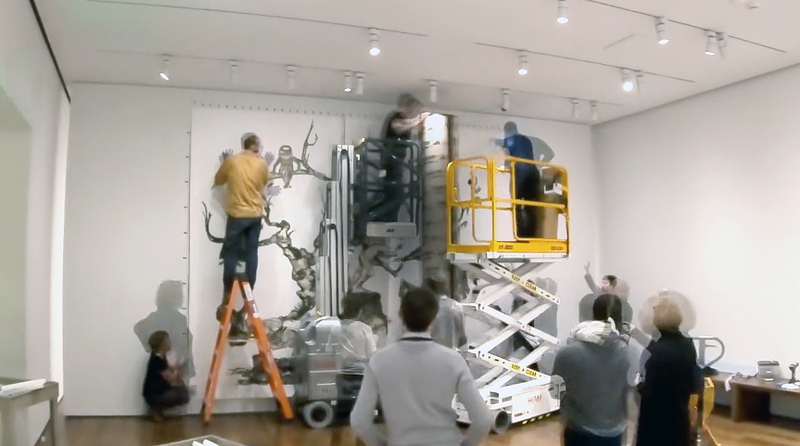 A time-lapse video shows Kara Walker’s U.S.A. Idioms being installed in the galleries. The collage on paper, at nearly 12 by 15 feet, is the museums’ largest unframed drawing. 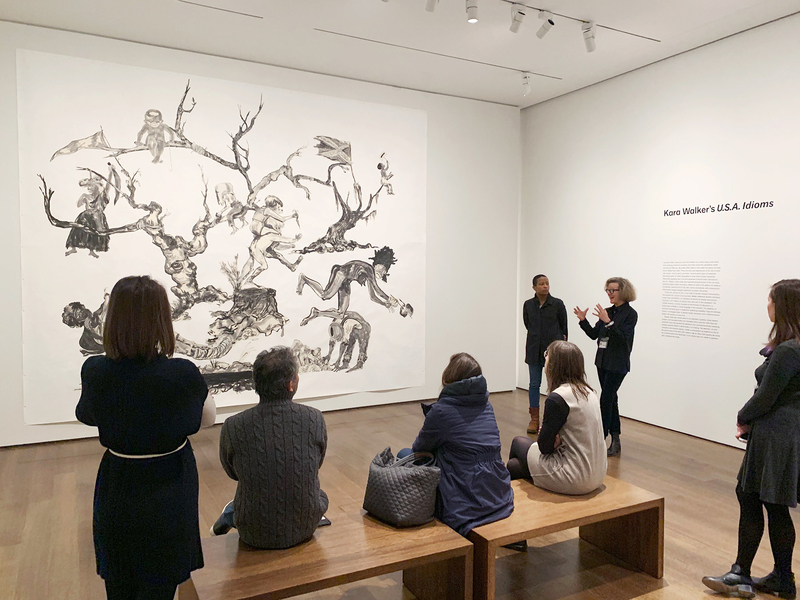 On the morning it was installed in the gallery, Kara Walker’s U.S.A. Idioms was revealed slowly, inch by inch. The collage on paper, nearly 12 by 15 feet, had been stored around a long roller. As installers unrolled it from left to right, figures began to appear: a woman hanging from a tree branch, a girl holding bandage wraps, an inert soldier. Then, more figures and more trees, in varied stages of life and death. A white flag. A Confederate flag. After three hours—during which a team of 11 conservators and collections management staff carefully affixed three edges of the work to the wall with tiny magnets—the entirety of U.S.A. Idioms was on view. Those in the room stepped back to take it all in. “I’ve seen reproductions of the drawing, but this is the first time I’ve seen it in person,” said Chassidy Winestock, a Ph.D. candidate in the Department of History of Art and Architecture at Harvard, who has studied Walker extensively. Winestock wrote the wall label for U.S.A. Idioms as part of her internship with the museums’ Division of Modern and Contemporary Art. Gigantic and layered in its materiality, the collage is also awash in symbolism and ambiguity. It was one of a handful of works Walker produced in response to the deadly white nationalist rally and counterprotests in Charlottesville, Virginia, in the summer of 2017. When U.S.A. Idioms was shown for the first time at Walker’s show at the Sikkema Jenkins & Co. gallery in New York City that fall, a long line of people snaked around the block waiting to see it. Mary Schneider Enriquez, the Houghton Associate Curator of Modern and Contemporary Art, and Chassidy Winestock, a Ph.D. candidate in the History of Art and Architecture at Harvard and a graduate intern for the Division of Modern and Contemporary Art, discuss Walker’s monumental drawing. Mary Schneider Enriquez, the Houghton Associate Curator of Modern and Contemporary Art, and Edouard Kopp, the former Maida and George Abrams Curator of Drawings in the Division of European and American Art (now chief curator of the Menil Collection’s Drawing Institute), viewed the show in advance and were keen to bring one of these intensely contemporary and topical works to Harvard. Now the largest unframed drawing in the museums’ collections, U.S.A. Idioms is so powerful, in part, because of its enormous scale, Schneider Enriquez said. And like everything else in Walker’s oeuvre, it forces viewers to confront their own understandings of history—to face such explosive and difficult subjects as slavery, injustice, and racial terror. 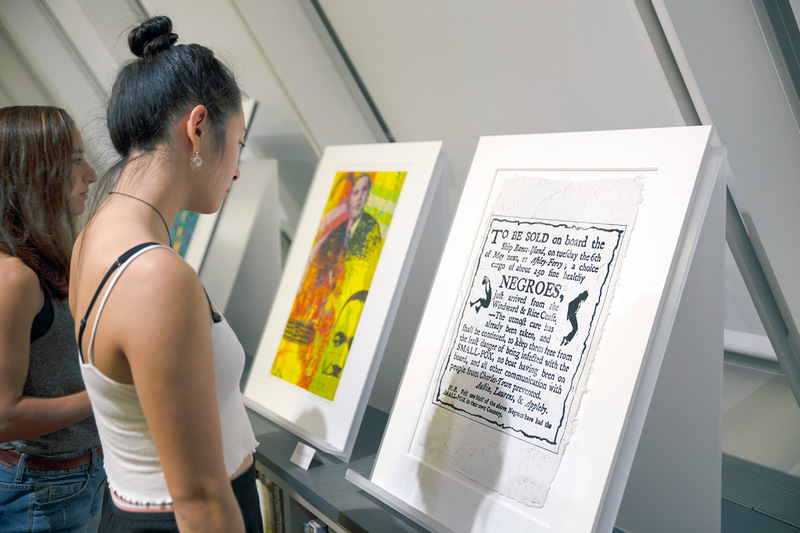 The installation featuring U.S.A. Idioms also includes three prints by Walker. Winestock pointed to Confederate Prisoners being Conducted from Jonesborough to Atlanta (2005), in which a large black silhouette “interrupts” our view of an illustration from Harper’s Pictorial History of the Civil War. “Walker’s work makes it impossible for us to look at a lithograph like this and say, ‘Oh, that’s just history,’” said Winestock. 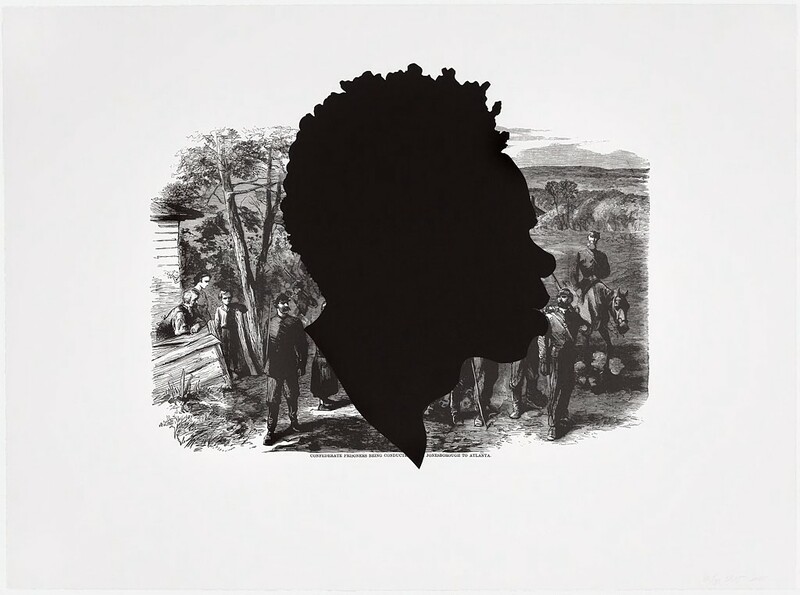 2008.5 Kara Walker, American, Confederate Prisoners being Conducted from Jonesborough to Atlanta, 2005. Offset lithograph and screenprint. Harvard Art Museums/Fogg Museum, Margaret Fisher Fund, 2008.5. 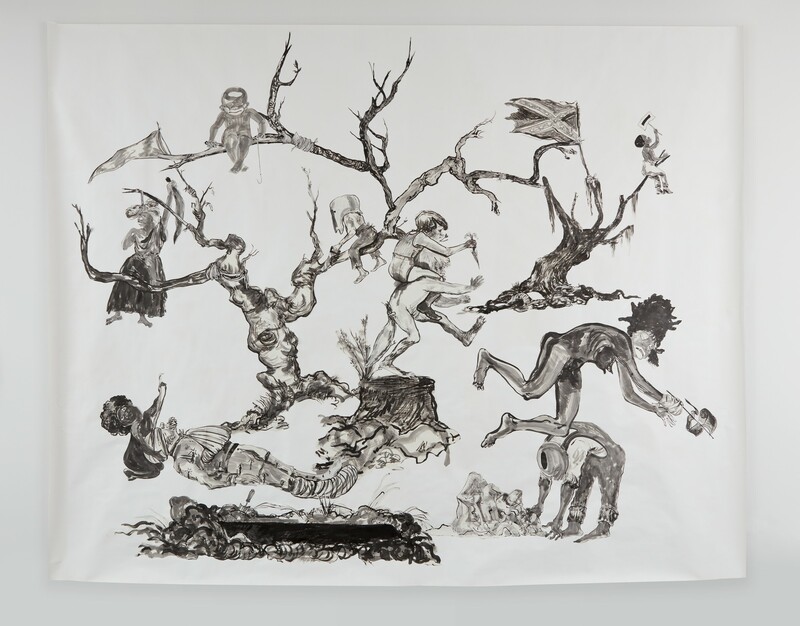 © Kara Walker, Courtesy of Sikkema Jenkins & Co., New York. U.S.A. Idioms, Confederate Prisoners, Freedom: A Fable, and Li’l Patch of Woods are on view until early October. In the meantime, curators expect the installation will spark plenty of discussion, both within the gallery and in more structured academic settings. Kara Walker, American, U.S.A. Idioms, 2017. Collage of Sumi ink and graphite on cut newsprint on gessoed white wove paper. Harvard Art Museums/Fogg Museum, Margaret Fisher Fund, 2017.220. 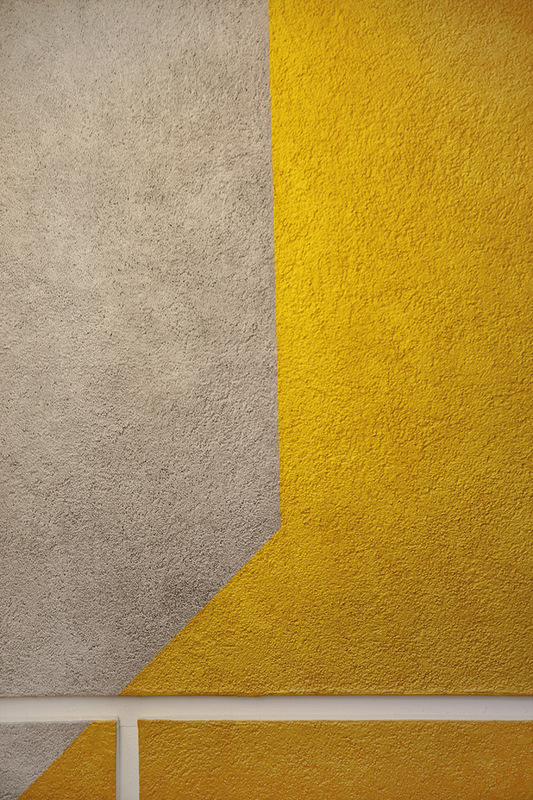 Representatives from the estate of famed conceptual artist Sol LeWitt recently re-executed his vibrant and imposing Wall Drawing #830 at Harvard.